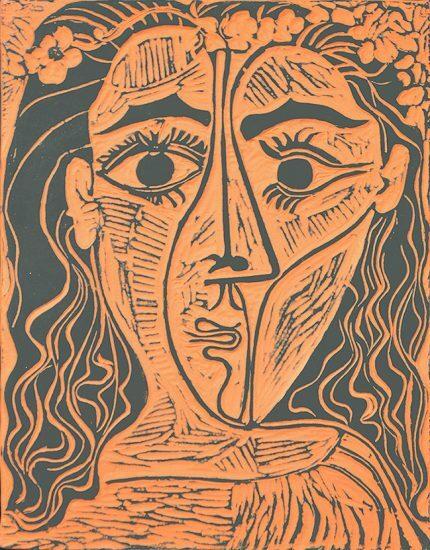 Pablo Picasso was a prolific artist, creating an immense oeuvre in multiple mediums including graphic (with a large printed body), sculptural, ceramic, and some glasswork. 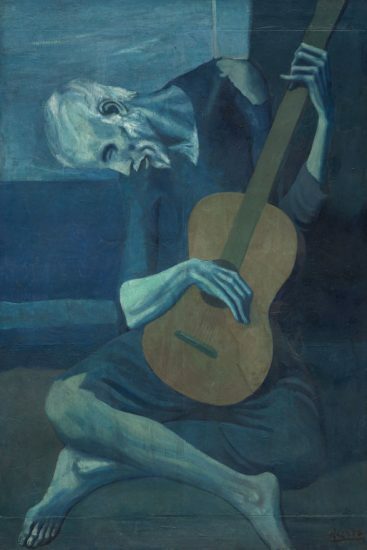 Throughout his long artistic career, Picasso explored many diverse themes and subject matter in his work. 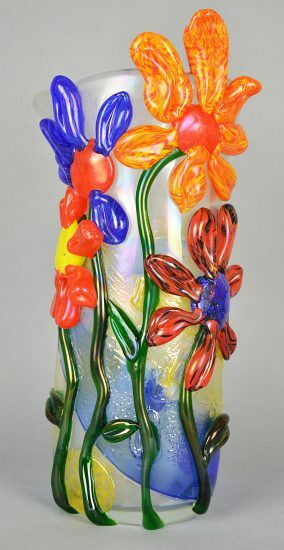 One of the artistic designs that we can trace throughout his career are depictions of flowers in his work. 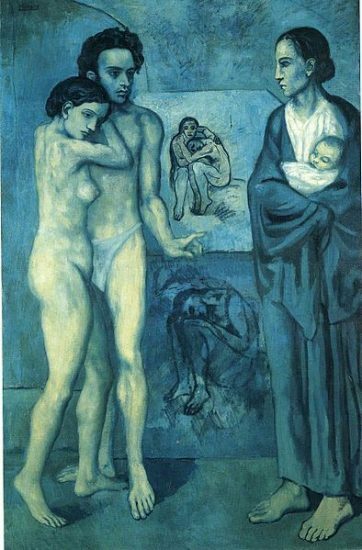 In the early days of his career Picasso was more prone to naturalism than in his later works. We see this representing in Fleurs, 1901 which now hangs in the Tate Modern, in London. A bountiful bouquet of flowers in classic still-life form rests as the central image of the canvas. It sits on the flat plane of a table and behind is a neutral blue wall against which the rich reds, oranges, and yellows pop. Each flower is rendered realistically with petals gently delineated. 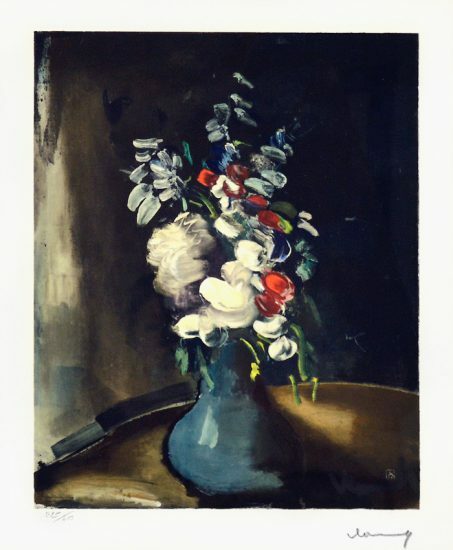 The lithograph based on Jacqueline with Flowers shows, in part, the transition to his later style. 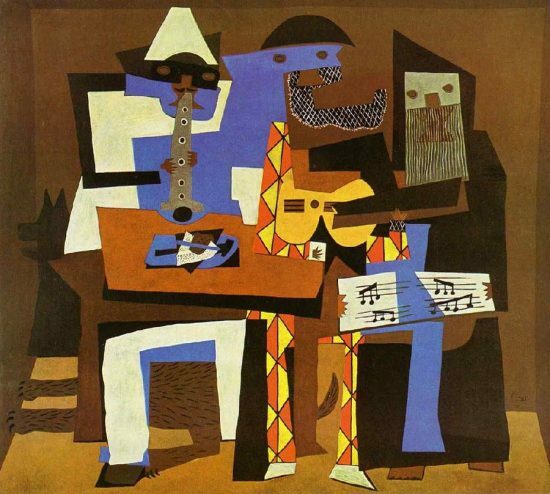 Picasso is credited with the development of the cubist style in the early 20th century. As naturalistic as the previous work looked, only 9 years later Picasso’s still-life bouquet looks quite different. In this classically cubist work Vase de fleurs, 1910, the subject matter of flowers almost disappears. 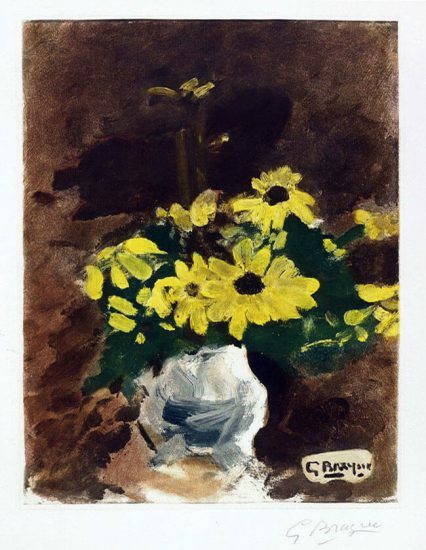 The tonal palate is full of browns, yellows, and grays, nothing like the more realistic palate of Fleurs, 1901. Through the angles, we can just make out some highly abstracted flowers, which blossom from a vague vase in the middle of the painting. Later, in 1946, we see yet another interpretation of Picasso’s flowers. 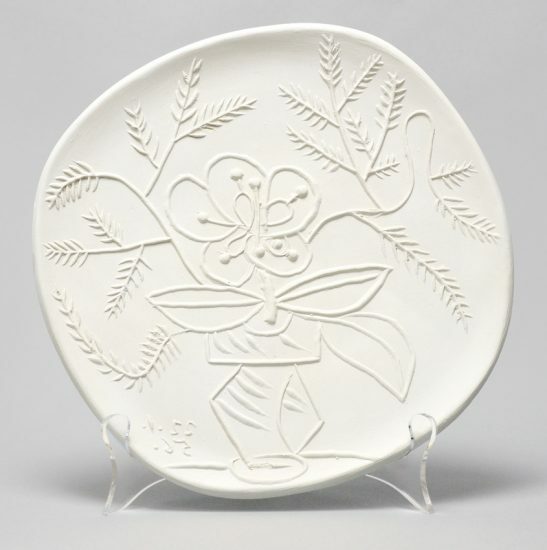 This time, his lover, Françoise Gilot, has been depicted as the flower herself. She is in full bloom with full petals that double as hair, and drooping leaves. 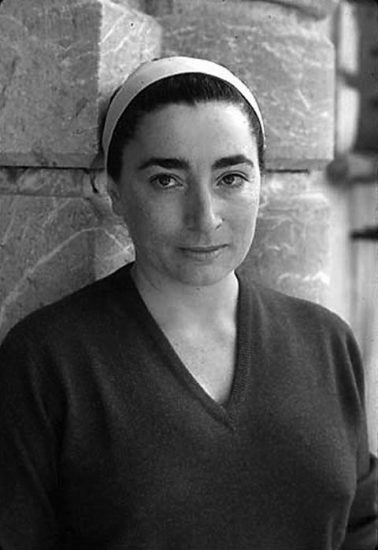 The message of fertility is strong here, with Gilot depicted having large breasts that double as petals. As we go later still in Picasso’s career, another style of depicting flowers comes about. Bouquet of Peace depicts simplistically drawn yet brightly colored flowers as the centerpiece of the composition. The flowers all appear as a similar type, but what is more important is the feeling the flowers engage in the viewer with their bright, ray-like petals. 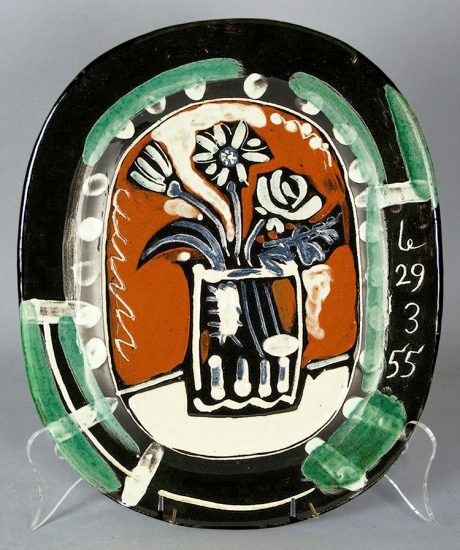 Picasso also worked in the ceramic medium and depicted still-lives of flowers. 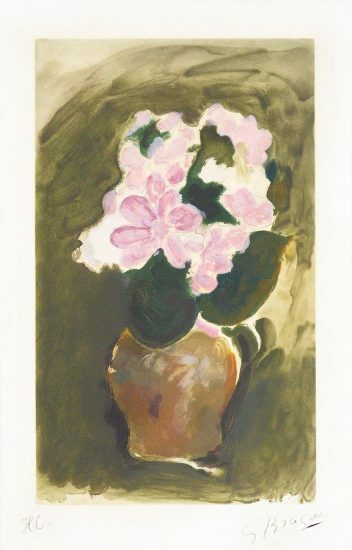 Bouquet à la pomme (Bunch with Apple), 1956, shows three different types of flowers in a vase. They are all rendered in outlines without color, but Picasso has taken care to make each one distinct. This is similar to Bouquet (Bunch), 1955 where the flowers are all painted in the same colors, but are made distinct by their shapes.